Nematodes as Biological Models is two-volume treatise that provides a comprehensive reference source for research, in which free-living nematodes have been used to examine fundamental processes in genetics, development, nutrition, toxicology, pharmacology, and gerontology. The text emphasizes the use of Caenorhabditis elegans as a model in a variety of biological studies and also includes description of important studies utilizing other free-living nematodes as models. 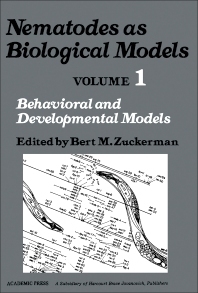 Volume 1: Behavioral and Developmental Models covers cell lineages, muscle development, behavior, the nervous system, control mechanisms, and genetics, with the major emphasis on C. elegans. Significant contributions derived primarily from studies on the parasitic nematode Ascaris and the free-living nematode Panagrellus are also considered. The second volume includes discussions on free-living nematodes as biological models for pharmacological and toxicant testing, and for studies on gerontology and nutrition. Several chapters in this volume also cover nematode physiology and morphology, which readers will find useful in understanding the subject matter. The book is a masterful reference for students and lecturers in parasitology, zoology, physiology, and other related biological courses. Researchers and extended workers on nematology and related disciplines will also find this book invaluable.